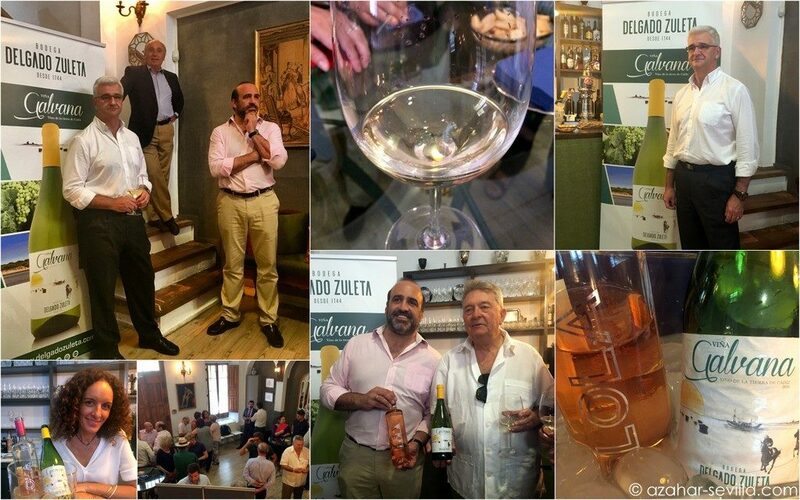 This week I was invited to a private tasting for this year’s edition of Bodegas Delgado Zuleta’s D.O Cádiz white wine Viña Galvana. Delgado Zuleta is of course best known for its sherries (it’s said to be the oldest bodega in the marco de Jerez), especially Manzanilla La Goya, but also produces local white wines. The 2017 Viña Galvana (85% Palomino Fino and 15% Muscat) is a fresh, light wine with a bright pale gold colour and a touch of fruitiness, and pairs well with fish and seafood. Perfect for the summer weather. The label pays tribute to one of Sanlucar’s most popular events, the annual horse races on the beach which take place every August. The cata was presented by Jorge Pascual, the Director-General of Delgado Zuleta and enologist José Antonio Sánchez Pazo, with promotion by @ProbandoGastro. The event was hosted by Cinta Romero and her team at La Cochera del Abuelo, who also provided a light post-cata lunch. Thanks to everyone who helped organise this very pleasant event.